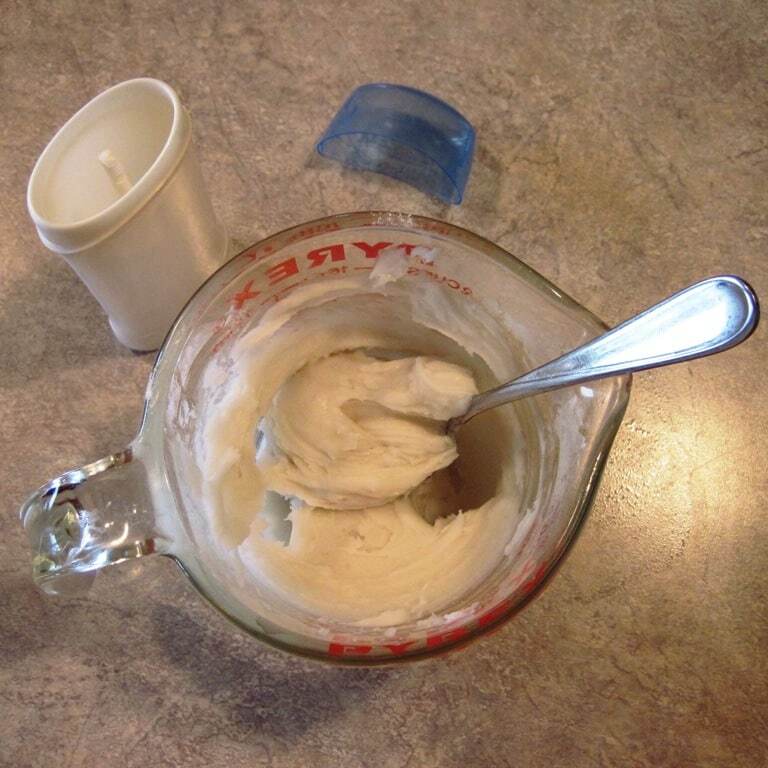 Homemade deodorant recipes are a great alternative to standard deodorants. Regular deodorants can be pretty nasty. The aluminum and other chemicals in standard deodorant have been linked to breast cancer. Even the crystal deodorants (which I had been using recently) contain aluminum compounds. One study I saw recently indicated that the crystal deodorants may actually be more dangerous than regular deodorants. (This ticked me off when I read it, truly.) My grandmother battled breast cancer, and I lost my older sister to internal cancer, so I've been working to detox our home, diet and our personal care products. You could use this mixture as is and apply with your fingertips, but it’s pretty messy. Best option: use an old deodorant container. I used arrowroot powder because I had some on hand that had been in the cupboard a while, and 5 tablespoons of refined coconut oil. This first time around I skipped the scent, because my son was also using the same deodorant (yeah, maybe that's a little gross, but at least he's using deodorant, musty little monkey that he is). The mixing was easy. The trickiest part of the whole process was loading it in the tube. When I do it again, I may load it into a pastry bag and just squirt it right into the container. After all, every ingredient is food grade, right? Everyone's been asking how well it works, and from what I've tried so far, pretty well overall, at least as good or better than most deodorants I've tried, “natural” or otherwise. It may stain light colored clothes because of the oil (I didn't run into this, but others have). You can use cornstarch or arrowroot or both – whatever works for you – and adjust the ratios a bit if any of it irritates your skin. I found it to be less irritating than many commercial deodorants I had tried in the past (it really didn't bother me at all, rubbing it on was a tiny bit scratchy). I do shave my armpits regularly, and did not have any problems with shaving irritation using this deodorant. I'm gonna confess now that I haven't been using this during the worst of the summer heat. Not because I switched back to regular deodorant, but because I'm trying a little experiment. Katie did an update on her deodorant post in which she reviewed a product called Herbalix Deodorant. It really seemed to me that she didn't give the company a fair shake, and it bothered me. I personally felt that I wanted to try a detox type product, since my mom had to have inflamed/clogged lymph nodes removed from under her arm when she wasn't all that much older than I am now, and I had a weird rash pop up on my knees recently. I contacted Herbalix and said that I would like to take their detox challenge and blog about it, and they looked over the blog and gave me a thumbs up. (They even sent mini samples for the boys to try. The boys were so tickled to try their own very special deodorant. It was pretty funny – you'd think when that box was opened and they saw the deodorant that it was some sort of much coveted video game.) I'm in my third week of detox, and haven't run into the problems that Katie did. The rash on my knees has cleared up (I had treated it with a variety of topical treatments, including kombucha, but nothing cleared it up entirely). Mike from Herbalix suspected that I might have some lymph blockages in my legs causing toxins to back up and reroute around my knees, causing visible inflammation, so he suggested I put the detox deodorant on my feet at night as well as my armpits. It worked! 🙂 I've also dropped a couple more pounds, which could just be a happy coincidence, but I'm pleased with it anyway. I'll do my official review in a couple of weeks (see the review here), but I just thought I'd let you all know what was going on. If you want to learn more about all the nasty stuff commonly found in deodorants and other cosmetics, visit the Herbalix site and scroll down to the bottom of the page to the “Knowledge Center”. I've been more than impressed with the depth of knowledge these people have. As Liz and I discussed their product and the health concerns I wanted to address, she sent me a TON of information from independent studies showing just how detrimental standard cosmetics are, and how Herbalix is different. I'm fairly well read on the subject, but there was a lot of information I had never seen before. (What can I say? I dig smart people who are uber-researchers like myself.) Full disclosure – they sent me free product samples for my review, but my opinions are my own (lol – anyone who's been reading my posts for a while knows that I have a lot of them 😉 ). Read my review of the Herbalix deodorant here. Rubbing a slice of lemon under the armpit to kill odor causing bacteria (don't use this on freshly shaved armpits!) My friend, Mary Jean, likes this option. A spritz of rubbing alcohol, with or without a drop or two of essential oil and/or witch hazel added (again, not a good one to used on freshly shaved armpits). Plain coconut oil rubbed in the armpit area – use sparingly and let sit a bit before getting dressed to give the oil a chance to absorb and reduce the chance of staining. Coconut oil is antibacterial and antifungal. Eating some sprouted fenugreek seeds in your salad. Just a small amount per day will make your armpits smell like maple syrup. 🙂 My teenage son was very impressed with this effect. Excessive underarm odor can be a sign of magnesium deficiency. (Read The Magnesium Miracle for more detailed information, or take a look at this post on Cheeseslave for a brief overview.) If you do find that you have very strong body odor, you may want to consider detox, dietary changes andPeter Gillhams Natural Vitality Natural Calm, Raspberry Lemon Flavor 16 oz. magnesium supplementation over industrial duty deodorant. Also, diet in general will strongly influence body odor. So what's under your arms? Leave a comment below to share your tips or leave a link to your own personal cosmetic recipes. Thanks for stopping in for a visit, and please share the post if you feel so inclined. I'm looking forward to seeing a review of how this works. I have seen a lot of these recipes on line. They all use corn startch or arrow root as a thickener. However, for diabetics this is not good, as they can get yeast infections in their arm pits and these carbohydrates feed the yeast. My DH has to have his dress shirts not starched for this very reason. Trust me, it was pretty icky. Eleanor – thanks for sharing that information – very good to know. Any other suggestions for thickening? The Herbalix products are specifically geared towards detox/improving health, but I know not everyone has a budget that will allow their purchase. What do you mean when you say 'crystal deodorants'? I use the same basic ingredients, but in a different way. I just spread a thin layer of coconut oil under my pits, then using a powder puff, pat on the mixture of 1/2 baking soda and 1/2 cornstarch. Mine has a few drops of tea tree oil and some lavender oil added. I actually made it through student teaching without stinking too much, using this deodorant! I just whipped up a batch of this using grapefruit essential oil for a scent/antibacterial. Will let you know how it works out. The coconut oil was a little soft because of the heat and it only took me three tablespoons. I put it in the fridge to stiffen up a bit. Ive been using the baking soda, and cornstarch for about a year now. But i just add water and a few drops of lavender oil, and store it in a closed jar. Its great. I use a soft toothbrush, to apply, or you could try a tiny makeup brush. back in the 90s, a friend first turned me onto the idea that humans, and all animals are predominately ‘self-cleaning’ with a little water and scrubbing (which for some animals is licking…others, a washcloth…or just hands…). around that time, i shaved my head. i’d always used shampoo and conditioner, and had recently been aware of all the toxics in many brands, so had upgraded to mucho expensive brands. when my hair was only a 1/4 inch, all i did was rub my hands across it in the shower. as my hair grew out, i rarely used shampoo, and even less rarely, conditioner. My hair was always clean! About 10 years ago, I met a woman in her 40s with long gray hair, about ½ way down her back. Her shampoo recipe? Hot water in the shower, scrubbing with her hands. That was another mindblower because I’d thought that I could only get away with ‘water shampoo’ because my hair was short. Seems anybody can wash their hair with water! About the only time I’ll use soap or shampoo on my hair now is when I’ve been exposed to something toxic—like insulation, asbestos, chemical fumes (not sure that water wouldn’t be as effective)—or when I’ve been exposed to poison ivy. I know that soap helps break down those oils when water won’t. Finally she gets to the pits. I’ve mostly not worn deodorant for 10 or more years. The 10 or more years before that I bought the ‘natural’ stuff. The only time I worry about it now is if I have extended corporate office time. Last time that happened, I made a ‘ball’ of coconut oil by softening it, then making a ball maybe 1.5-2x the size of a golf ball (huge hush puppy! ), which I then stored in the frig. Coconut oil is antibacterial which kills the critters that smell up our pits in ways that some find offensive (I used to be offended to, but now I tend to love the natural healthy smells of people). I used it at nite so it was soaked in my the morning (less problems with oil stains on my ‘downtown’ clothes). Love it! I think taking coconut oil internally can help with body odor too. I have used the above recipie for several years and LOVE IT!! No staining on my clothes and I use my coconut oil after if sits in the sun for about 5 mins to soften. WORKS GREAT!! My youngest has taken to using this now. He likes it because it’s mild but works. Yes, I add essential oils to it. No problems with razor burn, although I do usually shave my pits before sleeping, to give the skin time to rest before coating it with anything. But having read the comments here, I might add putting a bit of coconut oil on before sleeping, too. Sounds quite workable, and might be even more pleasant. Certainly more pleasant-smelling. Cher – thanks for chiming in. I’ve been working to increase my magnesium intake, too, which also affects body odor. All I do is squeeze the juice out of a lemon, strain it, and put it in a spray bottle. Two lemons gives you enough for 1-2 months of deodorant (although it does start to smell funky after a couple works, the scent doesn’t linger and it works perfectly in preventing stink). I just spray it 4 times on each pit and let it dry for a while before putting my shirt on in the morning. This works amazingly, my sweat has literally no smell (and I checked with family members who can attest to the fact that my body odor doesn’t smell at all!). However, *WARNING IF YOU’RE GOING TO TRY THIS (which you absolutely should)* it can sting sharply if you have a cut from shaving, so be careful! But it only stings for like, 1 minute, then goes away. Just my two cents 🙂 Just found your blog and quite enjoy reading it! I recently started making my own deoderant too. I just mix rubbing alcohol, tea tree essential oil, and maybe one more if I want a prettier scent. I like the spray bottle too, then it doesn’t go on too thick. If I find myself getting too sweaty I just splash a bit of rubbing alcohol on a piece of cotton and wipe the areas that the smelly bacterial like to hide in. I actually don’t normally wear deodorant. If I notice a slight smell, I just wash my pits. As mentioned, diet can play into personal odors. I was just wondering. I signed up to receive your posts by email as I am trying to cut down my “facetime” on Facebook. I saw this article posted on Facebook, but I haven’t received it in the email? Will I not receive all your posts via email? Deitra – you will receive all new posts by email, but each day I try to share one or more older posts on Facebook for those who are new to the site. This post was originally published in 2011. Haven’t used anything except water and a washcloth now for nearly 10 years – any change in diet/health can affect the smell of sweat so monitor your body that way – too many of my friends suffered cancers that could be linked to blockages from deodorant chemicals. What I notice is that eating clean reduces my armpit smell a high percentage. I’ve been able to take care of residual odor (especially when sweating) by drinking a few swigs of mint flavor liquid chlorophyll. I was so thankful that a friend gave me these recommendations and they work for me. My armpits have in the past smelled so awful that I’ve had to wash and re-apply deodorant several times a day. Embarrassing as well as unhealthy (because I was using conventional deodorant). Thank you for sharing so much detail with us! Diet has a HUGE influence on body odor. We found out the fun way with the fenugreek sprouts, but I’ve also found the not so pleasant option when I’ve eaten something I probably should have not. Be aware that the Herbalix Detox deodorant may make a person smell worse before they smell better. Hi, just wondering if the above recipe goes on feeling sticky? I have tried more natural deodorants (Toms of Maine in particular) and it feels sticky. Yuck, I think I would rather just be sweaty than sticky. Also, I don’t have a lot of free time, so other than Herbalix, any other deodorants that I can buy that are safer. (Natural as opposed to conventional.) Thanks! I’m still using Herbalix when I’m not using homemade, so I haven’t really experiment with other options. This recipe goes on smooth, not sticky. Just bought Lavilin for the first time. Excited to experiment with it. Heard Lavilin is the best one! I will try it in combination with your tips and let you know how it goes. Hi. I came upon your website tonight and saw the homemade deoderant recipe. I’ve tried this exact recipe before and i started getting little bumps and rash in my armpits during use. I stopped using it for a while and the bumps went away. I made another batch using only half the amount of baking soda and started using again. Again, the bumps came and they are itchy. Is this something I should not try anymore, or is this a way my body is detoxing? It makes me nervous when bumps show up every time I use the homemade deoderant. What do you think of this? It’s hard to say without seeing it, but it sounds more like simple irritation than detox. When I’d get what I suspect was a detox reaction, it would just be a simple pimple or a large pimple/cyst thing. No itching or irritation to speak of, and once it cleared, it cleared. I’d probably try a different option. An herbalist friend says she uses baking soda only. I had made the cornstarch/soda/coconut oil mixture, but her suggestion for the baking soda intrigued me. I had trouble with it initially causing bumps, but the slight abrasiveness looks like it was the problem. Now I shave at night, then apply the baking soda in the morning, patting in on – but not rubbing it at all. I have been odor free for months now. Do be careful with lime juice if you will be exposing your armpits to the sun, as it can cause phytophotodermatitis.